I was in two minds about posting some of these pictures. I'm not afraid to have a bit of skin on show, it just depends on what part. However, looking back at these I saw that A LOT of my stomach was on show, I get scared wearing something that's not super high waisted and cos I don't have a perfectly flat stomach and a set of abs I was a little worried it would be too much. Then I remembered I've started doing my own thing and I've stopped worrying about what other people may say/think. It's a different mindset I've adopted and honestly - I feel so much better for it. Now confession time, I have a low key crush on the Weekend, not Saturday and Sunday however that romance has been going strong since I quit retail nearly 5 years ago, I'm talking about the singer. . . . or is he a rapper? I'm not sure but yeah, I like that dude. [Bear with me I am going somewhere with this] I'm also partial to some of his songs in particular star boy which is what gets stuck in my head when I wear these star print trousers. I've got a love hate relationship with jeans when I was in the height of my emo days, I wouldn't be seen dead in anything but the tightest of tight skinny jeans, I'm talking bloody circulation stopping tight but as I got older the less I wore them. They're uncomfortable, make me feel frumpy and are so restrictive. Now when I wear a pair of jeans I opt for mom style jeans or buy pairs that are a couple of sizes too big for me for comfort. Even then I do tend to avoid wearing jeans at all costs - favouring leggings/treggings/slacks instead. These jeans are the first pair of skinnies I have bought and worn in a very very long time. 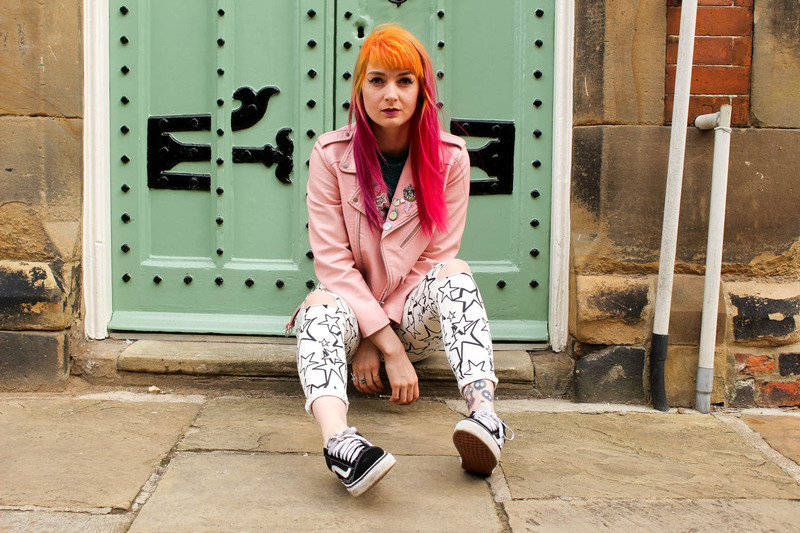 I was drawn to the Hayley Williams-ness of them and the fact that they were only £5.99 in the Zara sale and they are unlike any other jeans I've ever owned. The aforementioned reasons lead me taking the plunge one last time and I'm glad I did. Even though they're quite a fun pattern, they're still monochrome and I needed to get that colour in there somewhere, that's when my Zara pastel pink jacket stepped up to the mark along with my cropped teal top from Glamorous.